Attention: in the coming weeks tunnel maintenance has been planned. Are you parking between the 8th - 24th of April in P3 Long Parking or P4 Basic Parking? Between 22:00 and 04:00 the Buitenveldertunnel is closed for maintenance. Expect an increase of your travel time of about 35 minutes. More information. P4 is convenient and easily accessible from the motorway. It’s easy to find a car space here.The free Express Bus leaves every 15 minutes and brings you to Departures in about 10 minutes. You must pre-book P4 Basic Parking online. Your rate depends on the period of time you want to park, as well as the number of days. You will also be asked to provide your estimated Departure and Arrival times at the time of reservation. Please note that if you return much later than you originally planned, a € 10 fee per extra day will be incurred. Loevesteinse randweg, 1171 PK Badhoevedorp. See the route on Google Maps. 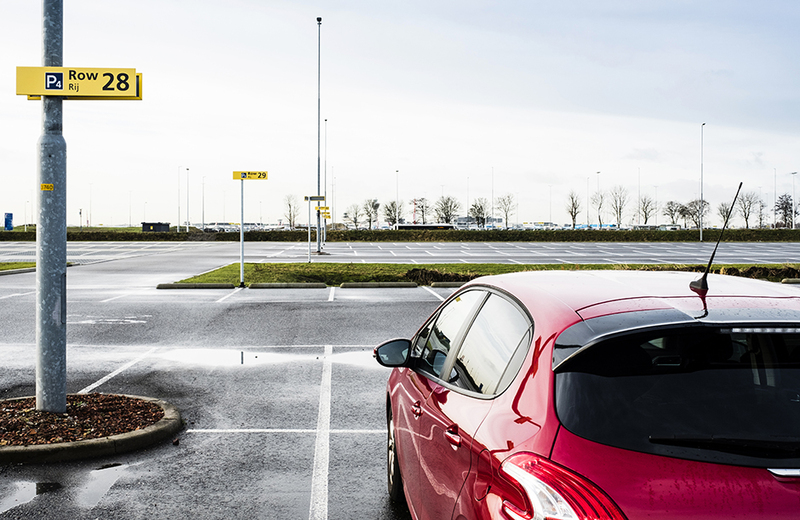 P4 offers very competitive parking rates at a car park close to Schiphol. It costs a lot less than other car parks because there are fewer services here than you may be used to – for example, there is a toilet available but there is no service staff present. However, you can reach a representative using the intercom at the payment machine or entry/exit barrier. The Express Bus arrives at and leaves from P4 every 15 minutes. It is a 10-minute journey on the bus to Arrivals and Departures. You can catch the Express Bus at the entry to P4. 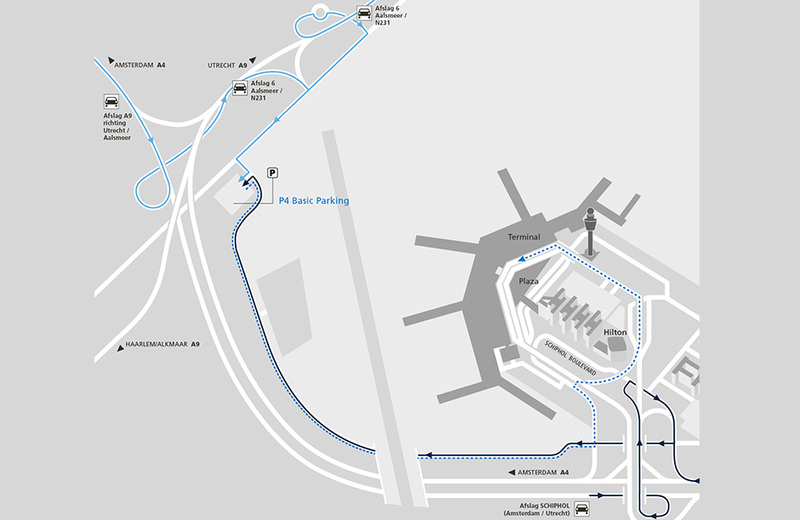 If you are returning from a trip, take the Express Bus to P4 from the A5 bus stop, opposite Schiphol Plaza. The Express Bus runs 24 hours a day, regardless of the number of travellers. You can recharge your electric car at P4, if space permits. You will see the electric charge points just after you enter the car park. The consumption rate of electric charging is € 0.30 per kWh with a starting rate of € 1.00. There are many accessible parking spaces available at P4. It costs nothing extra to park there. Please place your ‘blue badge’ parking permit in your windscreen. You need to book online to use P4 Basic Parking. The rate you have to pay depends on the period of time you choose, and how long your car remains in the lot. If you return later than expected, you will need to pay for the extra costs at the payment terminal. Please note that your arrival and departure times you make at the time of reservation can be indicative, but please remember that it will cost an additional € 10 per day. Enter Loevesteinse Randweg, Badhoevedorp into your GPS, or follow the signs toward Long-term Parking. P4 Basic Parking is opposite the Ibis Hotel and the bus station.